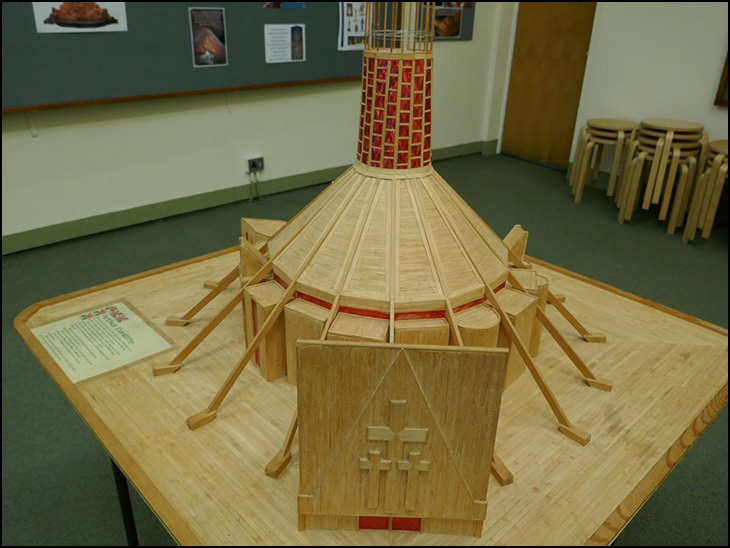 Matchstick Model of Liverpool Metropolitan Cathedral made by Arthur Cunliffe of Cherry Tree court Standish. Paddys Wigwam in matchsticks. Well done Arthur, that is some model,must have a considerable amount of your time. An absolute work of Art and what patience the man must have! It's inspirational. Amazing model. What a patient man to do this. How odd! I have just been reading Stuart Maconie's "Pies and Prejudice" whilst eating my breakfast and he was talking about The Anglican Cathedral. I put the book down, switched on P-A-D and there it was! (What a co-incidence... Should I buy a Lottery Lucky Dip, I wonder?!) I remember going there with school just after it was built. Well done to Arthur...amazing! Suspect the model is more structurally sound than the original, when first built. The central corona leaked, as did some of the side joints where concrete met marble. A similar issue had already arisen at Coventry Cathedral 5 years earlier. Lovely to see 'making' hobbies flourishing. Will today's generation be able to produce anything like this in the future? Yes, my mistake! Stuart Maconie tells that the Protestant Cathedral was deigned by a Catholic and The Catholic Cathedral was designed by a Protestant and my head was still full of that information when I turned from the book to p-a-d. It takes my brain longer to function these days than it once did! Thanks, everyone. Officially it's the Liverpool Metropolitan Cathedral of Christ the King. I personally don't like the outside but the interior is beautiful. I like the more traditional buildings. I also visited 'The Mersey Funnel' on a school trip soon after it's completion. Then we had to endure a performance of Macbeth at the Everyman Theatre. (who had supposedly been beheaded), and it fell off! I agree with Veronica; I too prefer traditional buildings now but when I visited it with the school, it seemed so "trendy", especially in Sixties' Liverpool when we were all young. Irene - Giles Gilbert Scott, Catholic, designed the Anglican Cathedral. Modern Gothic style, he died in 1960 and never saw it finished. Eventually completed 1978. Frederick Gibberd designed the Catholic cathedral, situated on top of the Lutyens undercroft from 1930s - a design abandoned because of the costs. Archbishop Heenan (later Cardinal, of Westminster) commissioned the new design in the 1950s - to a strict budget - to adopt a modern style. Finished in 1967. Both have merit. However, the Grand Willis organ in the Anglican cathedral is the best in the country and one of the best in Europe. Have a look here for another of Arthurs matchstick model. Just imagine striking all them matches and then having to blow them out straight away.